great news for you! 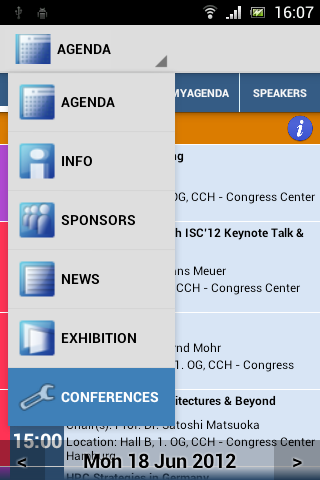 Your personal mobile conference assistant has been updated to v1.56 and changes are very important. At first glance, we changed an old style UI to new, more user-friendly interface. Conference4me has implemented an ActionBar with list of navigation tabs: Agenda, Info, Exhibition, Partners, News and new button ‘Conferences‘ for changing and downloading supported conferences. You can find this button in app menu too. Also we have implemented compatibility with new Android OS (4.2). Now we are working to optimize Conference4me for tablets. 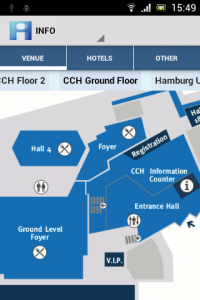 Conference4me 1.56 fixes many bugs like unexpected crashes on HTC with Android 2.3.3.